For a while it didn’t seem certain, but after a critical vote earlier this month, it looks like California’s on track to build high-speed rail. And, I’ll be the first to admit, California — with two large, global metros just a few hundred miles apart — is a great place for it. As great a day as it was for sustainable transportation, it also concerned me a little. Ohio and Wisconsin forfeiting billions for high speed rail to California is perhaps the clearest illustration yet of the growing divide between regions willing to invest in a livable future and those that are not. While Chicago reaps the benefits of transit- and bike-friendly policies under Mayor Rahm Emanuel (left), Ohio residents are paying the price for the obstinate refusal of Governor John Kasich (right) to invest in rail. It seems that America is on two divergent paths. Progressive cities are engaged in something of an arms race to design neighborhoods and build infrastructure to enhance the quality of life. In Portland, they have streetcars, light rail, and neighborhood greenways. In New York, expertly-planned public plazas are making the central business district more attractive and reclaiming neighborhood streets for pedestrians. Soon the city will add a world-class bike-sharing system to go with its growing network of protected bike lanes. Seeming to recognize how these projects help to attract talent and investment, Chicago jumped in the game last year, with newly-elected mayor Rahm Emanuel promising to build 100 miles of separated cycle tracks and moving quickly to improve the city’s bus network. Meanwhile, Ohio and Wisconsin — where talent and investment are no less needed — seem to have chosen a different path. Their Luddite governors are responsible for the painful loss of rail funds. And while there are counterexamples — Cincinnati and its streetcar, or Madison and its bike-share system — these places are moving much more slowly to adopt the kind of infrastructure that’s making places like New York and San Francisco increasingly desirable. The obstacles in these regions are many. At the top of the list, you have harmful political decisions — typified by the unilateral rejection of passenger rail by Walker and Ohio Governor John Kasich. And political resistance is reinforced when locals who prefer transit and walkability move away, as young, college-educated Midwesterners have been wont to do. Even where there is political recognition of the desirability of bike and transit infrastructure, these places may not have the money to expand them. For example, Cleveland, where I live, does not own a machine that can alter the striping of city streets to, say, make room for bikeways. Detroit can barely afford to keep its bare-bones transit system operational. It doesn’t get any easier to invest in things that make your city desirable if people are leaving your city. The danger is that, when it comes to giving people the option of safely getting around without driving, much of the country will simply get left behind. You can see this pattern at work when you look at the level of support for transit operations in different regions. 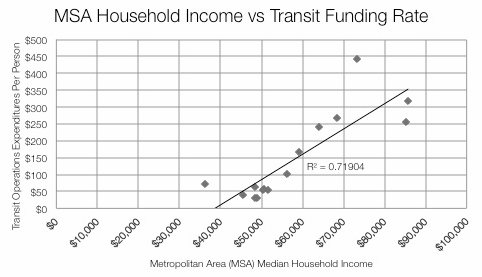 Yonah Freemark, a master’s student in planning and transportation at MIT who writes The Transport Politic, examined transit spending by region and compared it to median household income. He found the two — wealth and transit funding — are strongly correlated. Freemark examined 15 metro areas, finding that wealthier ones were funding the operation of their transit systems at proportionally higher rates than their less affluent counterparts. A 50 percent increase in regional median income is associated with a 220 percent increase in transit spending, he found. The reason, he determined, is pretty simple: Areas that have more money can invest more money in transit. Freemark’s conclusion was that funding transit operations at the local — rather than the national — level perpetuates inequality. Detroit’s poor transit forces lower income folks who can manage it to own cars, an enormous burden they might avoid in a wealthier metro with better transit. “Regions that are already well-off are making themselves better off, while those that are poorer are reinforcing their economic problems,” Freemark concluded. Giving states more control over bike and pedestrian funding, as the recently passed federal transportation bill will do, could have a similar effect on street safety. The new bill lets states forgo spending on these modes if they choose. That’s very likely more bad news for places like Ohio and Wisconsin. Thanks for the article. I am driving with my daughter from Boston to Seattle this summer on her way to college. I will avoid Ohio altogether, instead taking the CA route from Buffalo to Detroit. I’ll drop a line to Governor John Kasich, perhaps including receipts for fuel, food and lodging I paid to Canadian businesses just to avoid his state. I’ll “fill up” (food/fuel) in Chicago, and thumb my nose at Walker (though might sneak a few of my tourist dollars into Madison. Us little people have few tools at our disposal. What I can bring to the table is the ability to choose to spend my dollar in places that support good policy, and to tell those that don’t what they are missing. Maybe they’ll realize that for every one person like me to write a letter, there are 1000 that make the same choice but don’t bother to tell them about it. I know that you live in Ohio and so this is all especially bothersome to you, but this is really what state’s rights are all about. It allows experimentation among the states. Are some making bold experiments? Yes. And while I’m hopeful that California is the one making the right choice, it’s not clear that they are making the bold one. It is all in how you read the chart. Scott Walker would take away the idea that, if he (further) reduces Wisconsin’s mass transit funding, he may be able to drive down median state income to make the state more business friendly. Taking money away from the middle class and poor and handing it to the rich who may decide to create jobs with it hasn’t worked as well as he predicted. I have to echo BKMatt: the majority of people in Ohio apparently agree with John Kasich, not us. The one consistently wonderful thing about democracy is that people get exactly the government they deserve, because they chose it. Now they may have chosen it for an entire litany of wrong reasons. But that is exactly why they got the government they deserve. As you point out, young talented people are deserting the states dominated by elder-think and moving to places that want them. From a purely economic point of view, it’s crazy. For someone to move from Cleveland to Chicago or one of the coastal states has increased her or his cost of living enormously. Even supposing the higher income that will likely be garnered in the new city, that person’s wealth accumulation potential has plummeted because of the enormous differential in housing costs. But one can’t put a price-tag on acceptance. People like Walker and Kasich don’t WANT people like you to live near them. It’s a simple as that, so I say, let those states wither. Eventually centrifugal social forces are going to tear the United States into three societies. Be sure you are living in a state with congenial people when that happens. There is no doubt in this writer’s perspective that it was bold. Whether it was ‘right’ is another story. Back to Angie: your comparison with OH, WI and FL is most appropriate. They chose to play it safe – you have to recognize that CA is starting a $68 billion project with $3.2 billion in fed’ funds and $4.7 billion in state bonds. With no federal largess in the foreseeable future, the remaining $5.2 billion in Prop 1A, 2008 state bonds can’t be appropriated. Many wanted CA to follow in the aforementioned footsteps. Why must I be reminded about Gov. Rick Scotts tea party decision to refuse gov. funding for Florida’s High Speed Rail? I get so fired up!! The more-willing-to-invest cities are by and large those that have had housing costs skyrocket since 2000 and didn’t collapse during the downturn. The high level of wealth in those cities may be as much because the lower-middle and working classes of those communities have been pushed out of it, not because the improvements themselves generate wealth but because the high prices throw off high tax rolls which provides more money for improvements. But a high cost of being in one’s community cuts two ways — it may very well be possible to have investment increase outside those cities precisely because the costs outweigh the benefits of improvements. In such a scenario, the people that live in a Cleveland or St. Louis may not see many infrastructure improvements, but may see better quality of life, as they are more likely to be employed and their dollars go farther. (This may not reflect reality in comparison with, say, Washington DC and Northern Virginia, but certainly does for Los Angeles or San Jose). My argument for all of this is not really against what you’re saying, but rather a different focus is needed — one that looks at cost-containment and cost-efficiency (in improvements in areas that need more, in cost-of-living in areas that have plenty). Yes. And while I’m hopeful that California is the one making the right choice, it’s not clear that they are making the bold one. I have to take issue with the idea that people in Cleveland and St. Louis would be more likely to be employed than those in higher income areas. It seems much more likely that the opposite would be true. We had a Governor before Kasich that developed this whole train proposal. I don’t think it’s that simple. GOP Demands a Stop to Stim Spending. What Will It Mean for Rail Projects?